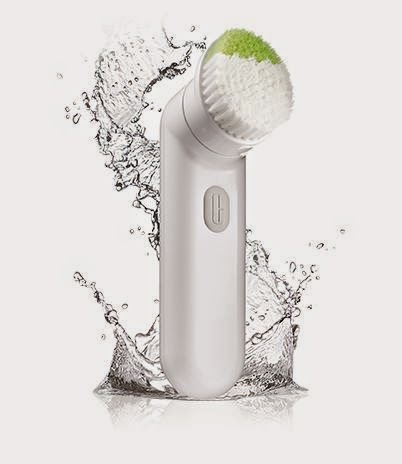 It's your lucky day readers - today I'll be introducing AND giving away the brand-spanking new Clinique Sonic System Purifying Cleansing Brush! Touted as Clinique's answer to the famous Clarisonic, this brush is designed to give you that fresh-faced summer radiance all year long. To produce this tool, Clinique worked with a crack team of Swiss engineers and dermatologists to develop this revolutionary new addition to their 3-step skin care program. Designed to work with their existing cleansing products, the Sonic will help remove makeup, clarify pores and slough away dry, dead skin. So how does this brush differ from the Clarisonic and other cleansing brushes? You can purchase the Sonic anywhere where Clinique is sold for $95, but right now I have a special opportunity for one lucky person: the chance to win their own Sonic brush! This giveaway is open to Canada and the continental US - the only requirement is that I ask you to report back with your results upon using this brush for a follow-up post here on Just J! Don't worry, you don't need to be a blogger; you just need to provide your honest opinion.